Damon & Naomi's show this Sunday at London's Rough Trade East will be as a trio after Damon trimmed the top of his finger off while cutting an apple. 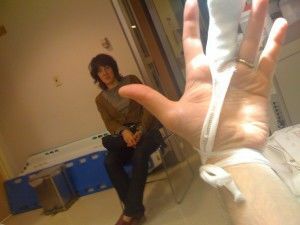 The show will go ahead with Alasdair MacLean of The Clientele doing the bits that Damon's finger prevents him from doing. How will Damon pull off this Django Reinhardt-like trick? We're all wondering. But coming to the rescue, fretwise, will be Alasdair MacLean of The Clientele -- he has graciously agreed to fill in for any missing fingers. Maybe the nasty accident will turn into something to celebrate? The show will also provide the opportunity to buy a limited CDR of Damon & Naomi covering Irving Berlin's White Christmas which they recorded for the film Lovely, Still. Each CDR will come in a hand-drawn sleeve. The show is free and starts at 7pm - collect wristbands from the shop one hour before showtime.